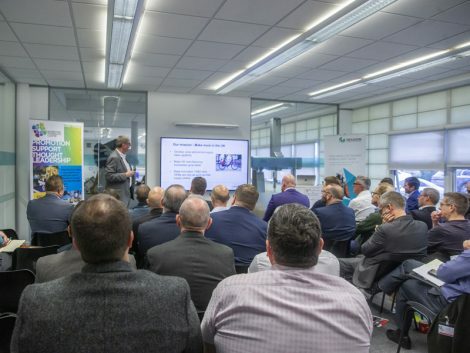 There has been swift praise for the Silverstone Technology Cluster’s Autonomous Connected, Electrified & Shared special interest group (SIG) after a packed room of over 50 people attended its first event of 2019. Nine presentations were made during the sell-out event with feedback suggesting that the SIG is prompting the UK’s automotive industry to have a much-needed re-think about how it tackles the future direction of technologies. The comments were in addition to those by ACES ‘Champion’ Simon Holloway who believes the SIG could be an incubator group that eventually helps to give the UK greater influence in the future of automotive technologies and trends. The audience comprised representatives from the finance sector as well as those directly working in automotive technologies including innovators, engineers, manufacturers and end users ranging from start-up businesses to SMEs and larger organisations. Among the presenters was Dan Bunting, Head of Business Development for the government-supported Advanced Propulsion Centre UK – an organisation that helps accelerate R&D and industrialisation of low carbon propulsion technologies through match funding. Mel Potter represents two businesses in Marlow, Buckinghamshire: Drive Electric, the UK’s largest electric vehicle leasing company, and Crowd Charge whose world leading smart charging technology is being launched in the UK & Japan. And she added: “It’s also been very interesting to discover that our business model makes us an investable company, and there are opportunities at the STC to make this happen. Another to present was Chris Kirby, CEO of Milton Keynes based Tomorrow’s Journey – a technology platform that allows vehicle assets to be shared among multiple service providers. “It’s really interesting to meet businesses of our size in a dynamic space,” said Chris. “But apart from being a great opportunity to meet the right types of people, already from this event we’ve made connections with people who’ve said they are interested in talking to us about some projects. Meanwhile academic Philip Guest (Oxford Strategy) used his award-winning research ‘The Four Horsemen of the Autocalypse’ to demonstrate how digitalisation in automotive in the next two decades will become as influential as the technology race in media and communications during the Nineties and early Noughties. “All good business people known that networking is a powerful tool provided it is with people who can help you to develop your business and this is where the ACES SIG has got it absolutely right,” he explained. “The STC quite rightly has understood that ACES needs a collective SIG; not a SIG for each of its strands. It means you have a room full of people who aren’t just appreciative and knowledgeable but, crucially, they have their heads and eyes up and are really awake to what is happening. CLICK HERE for a re-cap on and to download each presentation from the STC’s February 2019 ACES SIG.